Today's aircraft operator considers their aircraft not just a mode of transportation, but an extension of their office and their home. That mindset affects the way aircraft interior designers combine aviation materials, fabrics and paint to create the overall aircraft design, both inside and outside the fuselage. Duncan Aviation aircraft design experts share their insights and observations about the current interior design trends of business aviation. A new variation is a take on a European method of using non-standard materials, like leathers, in cabinet construction and designing drink rails that use contrasting woods and undertones. The latest in personal technology is beginning to show up in the interior design of the aircraft. For example, it is becoming standard to incorporate iPad technology and personal monitors into the design of each passenger seat, especially in the smaller business aircraft. Operators of larger business aircraft are still opting for full monitors to take advantage of the high-definition (HD) technology, and they want large but thin monitors mounted in their aircraft. Many operators also expect the convenience of using Wi-Fi for personal and seamless carry-on technology. Operators today want practicality in their aircraft interior, while at the same time, being stylish and personal. Some customers are choosing to make a statement and really show off their individuality with the accent colors in the aircraft. Grass green, turquoise blue, oranges and yellows are some of the latest accent colors adding a nice, extraordinary finish to aircraft interiors rolling out of Duncan Aviation hangars. Another fairly recent change is consideration for the environment when choosing interior products for an aircraft. Duncan Aviation customers are demanding more “green” products and processes. And, it’s not all about the carbon footprints. They’re also concerned with the toxins and gasses emitted by manufactured products and materials. 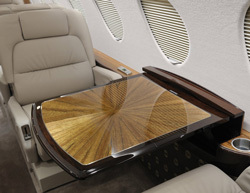 Aircraft operators have options for composite and reconstituted wood veneers that replicate the wonderful veneers produced from natural woods. These veneers are equally durable and upkeep and care is comparable to that of the natural wood veneers. For those customers who prefer the natural wood veneer, straight-grain species such as a walnut or eucalyptus are very popular for their neutral brown color and availability of high-quality logs. A new variation in cabinet construction is a take on a European method of using non-standard materials, like leathers and designing drink rails that use contrasting woods and undertones. Overall, operators want clean, simple, tailored lines in their cabinets. Aircraft seat design trends are currently being influenced by the auto industry. Operators are opting for perforated leathers, contrasting leather stitching, and seats covered with two complementing leather colors, which many manufacturers are using in the new aircraft coming out of production as well. Operators are also pleased with the introduction of new flooring products that simulate wood and stone, and requesting that these materials be added into their aircraft. Manufacturers are applying new, non-slippery finishes that make these products adaptable to aircraft. These new flooring products are a nice complement to the fabulous carpet options that are available. Need to refresh an outdated interior or worn paint? We specialize in custom designs, and we provide a three-year/1,500 hour warranty on paint, interior and avionics installation workmanship. Talk to a Duncan Aviation Design Professional today. View Duncan Aviation's latest aircraft refurbishment projects in our online paint and interior galleries.